Irrigation is the process of artificially applying water to land for agricultural purposes. When done properly, it can contribute positively to the growth of plants and crops, from seedbed preparation and germination to nutrient utilisation and plant re-growth among others. Therefore, if you have plans to set up a flower or vegetable garden, you must ensure that it is irrigated properly. Irrigation systems fall under two general categories: manual and automatic. Manual irrigation systems are less expensive than automatic systems, but they require more effort on your part as you need to turn the taps on and off at a specific time. On the other hand, automatic irrigation systems usually cost more, but they save you time and effort. They also enable you to water your plants when you’re away. Whether you prefer an automatic or a manual system, here are the five options you can choose from when deciding which irrigation system works best for your garden or farm. As the name implies, this irrigation system works by dripping water slowly into the area where water is needed. It utilises a network of pipes connected to a water supply and a set of special drippers that are connected to the pipes. 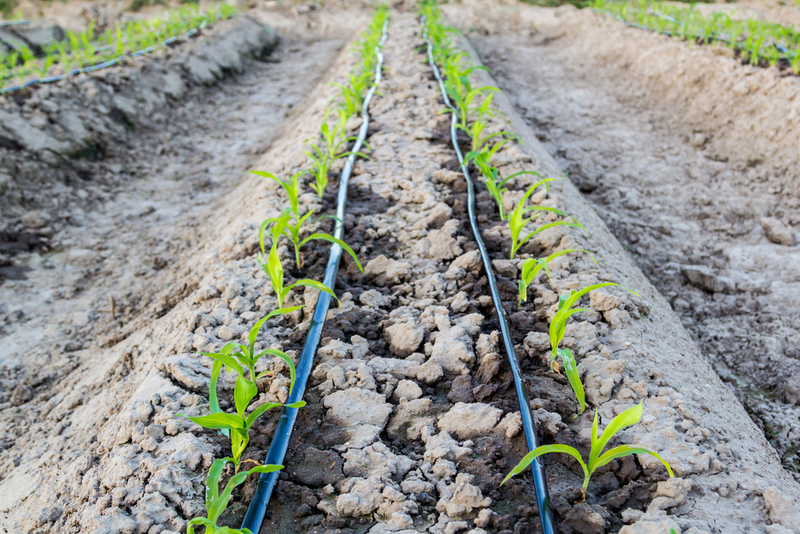 A major benefit of drip irrigation systems is that the plants’ root system is watered directly, thus, minimising the amount of water being wasted. In sprinkler irrigation systems, water flows through a series of pipes to be delivered in a fine spray to a specific area. You can either attach one sprinkler to a hose to water your lawn or garden or attach multiple sprinkler heads to a pipe or pipes to water the plants. When used correctly, this irrigation system can be quite effective. A centre pivot irrigation system is self-propelled and works with the use of a central pipe with outlets rotating around a central pivot point. It works like the sprinkler irrigation system, but it is much bigger and is supported by steel or aluminium towers. With this irrigation system, water is distributed evenly. The furrow irrigation system is less complex than other irrigation systems available today. In this system, small trenches or furrows where water can flow are created in between garden beds. This allows you to irrigate your entire garden by simply watering a small area. If your garden is located on sloped land, having a terraced irrigation system is highly recommended. In this irrigation system, a series of steps are created on the sloped land. Then, water is delivered to the top-most step, irrigating the land as it flows down to the succeeding steps below. If you are in need of a reliable irrigation system, be sure to contact the Goulburn irrigation experts – Goulburn Valley Sprinklers. Outstanding service, quality irrigation systems and great value for money.